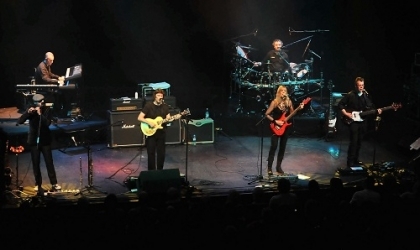 Steve Hackett and the Electric Band will be performing a special, unique one-off show - Past and Present – at the Islington Assembly Hall, London on Sunday 20 May 2012 in aid of Childline Rocks. To coincide with the event, they will release a double ‘A’ side digital single ‘Til These Eyes’ coupled with ‘Enter The Night’ (Radio Mix) on 21st May (20th on iTunes); part of the sales revenue from the single will also go to the charity. Hackett’s recent UK shows were reviewed enthusiastically: ‘mesmerizing’, ‘spine-tingling power and majesty’, ‘a bravura performance extending well over two hours’ are just a few of the words used to describe the dazzling shows. Timeless classics from both Genesis and Hackett’s solo catalogue will be performed on the night by Steve and his talented band, featuring Lee Pomeroy on bass (Take That) as well as regular band members Roger King (keyboards), Gary O’Toole (drums & vocals), Rob Townsend (Various saxes, flute, whistle and vocals) and Amanda Lehmann (guitar and vocals). ChildLine Rocks is an independent committee originally set up to raise money for Childline -twinned with the NSPCC - through live music. The first ChildLine Rocks event was held at London's indigO2 in March 2008; the line-up included Roger Daltrey, Lulu, Marillion, Thunder, Ian Paice (Deep Purple) and The Zombies. The event, which was compered by legendary DJ, "Whispering" Bob Harris, raised over 100,000 which paid for 40 new volunteer ChildLine counselors. The CLR committee is chaired by Malcolm Bluemel, the owner of Planet Rock Radio and includes Classic Rock and Yamaha amongst others.